Note to enable or disable the "User Account Control" (UAC) you should have administrative privileges. 1. From Start menu, open Control Panel. Go to "System and Security", under "System and Security" select "Action Center". 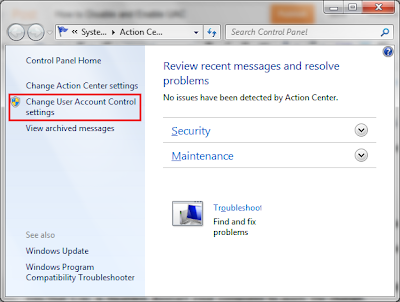 On the "Action Center" windows, click "Change User Account Control Settings" link present at left side of panel as shown below. 2. On the Run prompt or command prompt type UserAccountControlSettings.exe and hit enter. 3. Alternatively you can launch MSConfig.exe utility, go to "Tools" tab. Select "Change UAC Setting" tool and click launch. Now on the UAC setting dialog, set the notification level to "Never Notify". Note that setting this level will never warn you of any administrative action that is being taken by any Windows 7 certified program. You can Root your LG Optimus 2X with SuperOneClick easily. Before going ahead please ensure that you have the correct USB drivers installed for connecting LG Optimus 2X with USB cable. 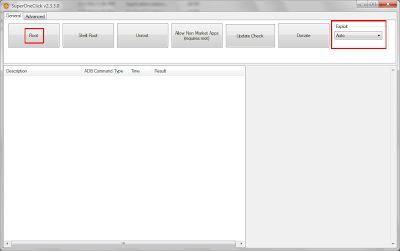 Once you have installed USB driver, download the SuperOneClick from shortfuse.org. Please download the latest version of SuperOneClick which will ensure the successful Rooting. Now connect you mobile to computer with USB cable. Enable USB Debugging on mobile. To Enable USB Debugging, Go to Settings -> Applications -> Development and enable USB debugging.Do not mount SD card. 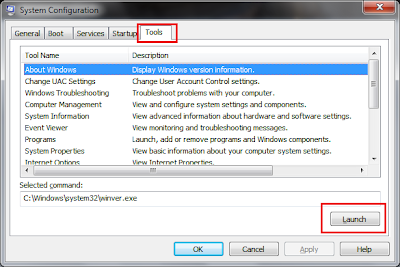 Msconfig.exe is a troubleshooting tool that can be useful as a launcher for multiple administrative tools in Windows 7. You can launch Msconfig.exe by typing "Msconfig.exe" in Run prompt and hit enter. It will launch the "System Configuration" window. On "System Configuration" window select "Tools" tab. As shown in below image you will see list of system tools that you can use. Select any tool from the list, and click "Launch" to launch the tool, alternatively you can copy the path of tools from "Select Command" textbox and run the command from command prompt or Run prompt. Note that you will require administrative privileges to launch the Msconfig utility and some of the tools listed by Msconfig. If you are not administrator then certain applications which require administrative privileges, will not run properly. You can right click a application and then run them as an Administrator, but if you want to execute application frequently then it becomes pain. In Windows 7 we can make application to run always as an Administrator. To do this you have two choices, one way is to set the property on application shortcut other is directly set the property on application executable. If you use the first approach it will be applicable to current logged-on user only and if you set property on executable then it will be applicable to all the users. If you want to set the property only to current logged-on user then On the Start menu, search the application shortcut that you want to always run as an administrator. Right click the application shortcut and click properties. 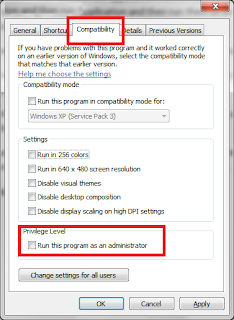 On "Compatibility" tab, select the checkbox "Run this program as an administrator" as shown below. When you move any window to the edge of the screen in Windows 7 computer, it tries to automatically arrange the window for you. Using below mentioned steps you can disable this feature, if you are not comfortable with it. 1. Open the Control Pane from Start Menu. Click on Ease of Access category. 2. From Ease of Access Center Click "Change how your mouse works". This will launch the "Make the mouse easier to use" panel as shown below. Alternatively you can open this windows by typing mouse in the "Search Files And Programs" box of the Start menu. Then select "Change how your mouse works" from the search result. 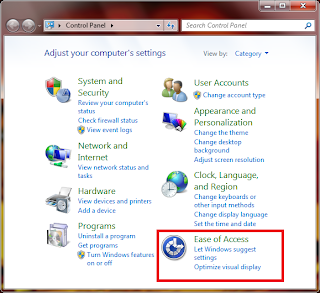 On above panel select the checkbox for the option "Prevent windows from being automatically arranged when moved to the edge of the screen". Now Click Apply and OK. This will launch the "Make the mouse easier to use" panel as shown below. Alternatively you can open this windows by typing mouse in the "Search Files And Programs" box of the start menu. Then select "Change how your mouse works" from the search result. On above panel select the checkbox for the option "Activate a window by hovering over it with the mouser ". Now Click Apply and OK.
Now when you move mouse over any window it will become active. Once you delete a file in Windows operating system, the index of the file is removed so that you will not be able to access the file contents. But if you use the recovery tools the files can be recovered if file is not overwritten by other files. Sysinternals has released a tool named SDelete with which you can use to overwrite the contents of the files that you have deleted. In turn SDelete overwrite the contents of free space on your disk drive. You can download SDelete from Sysinternal.